– The army said the window period for the fleeing terrorists to surrender is still open The Nigerian Amy has arrested 1,240 suspected Boko Haram terrorists in Sambisa forest following a mop-up operation in the forest. This is coming following the capture of Camp Zero used by the terrorists in the forest in Operation Rescue Final carried out by the army on Friday, December 23. 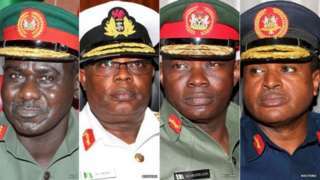 Irabor revealed that 413 of the suspects were adults; 323 were female adults; 251 male children, while 253 were female children. “We are interrogating them to know whether they are Boko Haram members, because there is no way somebody that is not their member would live inside Sambisa forest. “We are still on the trail of the terrorists and I want to assure you that all escape routes have been blocked. “Within this period, also, about 30 fleeing suspected Boko Haram members have surrendered to the Niger Multinational Troops on the shores of the lake Chad and we learnt that they were taken to Difa in the Niger Republic. “The suspects include; 24 male and six females. recovery of a Qur’an belonging to Boko Haram leader, Abubakar Shekau inSambisa forest following a military operation that led to the capture of the terrorists’ camp. He said the Qur’an was believed to be left behind by the Boko Haram leader when he fled from the forest and said the Holy Book will be presented to the president by Lt.-Gen. Tukur Burutai who is the chief of army staff.